Visit our Harry Potter Store! Join the discussion, order the fourth book, and explore more fantasy adventures. 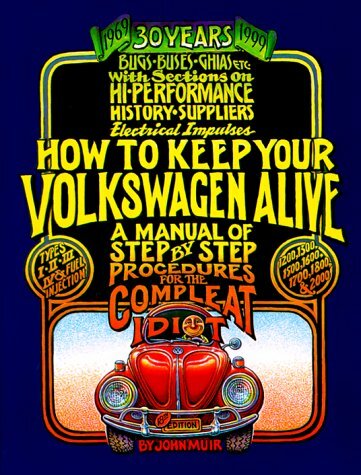 When How to Keep Your Volkswagen Alive was first published in 1969, launching John Muir Publications, it was affectionately adopted by VW enthusiasts, and John Muir found himself regarded as the "sage" of air-cooled VWs. As one reader put it, "This book is a philosophy lesson disguised as a repair manual." With clear instructions on how to fix absolutely everything in an air-cooled VW, it covers all models built through 1978, including the Bug, Beetle, Karmann Ghia, Bus, Camper, and more than 20 other vehicles. Full of funny stories, philosophical ponderings, and Peter Aschwanden's easy-to-understand illustrations, this special anniversary edition includes readers' accounts of how the book made them laugh out loud while they fixed their VWs and saved money. Offering clear instructions on how to fix absolutely everything in an air-cooled VW, this book covers all models built through 1978, including the Bug, Beetle, Karmann Ghia, Bus, Camper, and more than 20 other vehicles. 200 photos & illustrations. For novice and veteran mechanics alike, this book has provided humorous, step-by-step repair and maintenance instructions for all air-cooled VW's built through 1978 for over 25 years. This edition contains a new section on the electrical system, plus a revised resource list of VW clubs, magazines, books, and parts suppliers. 300 illustrations. --This text refers to an out of print or unavailable edition of this title. John Muir is regarded as the expert in the field as far as aircooled VW's. This book is extremely easy to read. It makes capable mechanics out of "compleat idiot"s with its easy going style. For a complete collection, buy the VW service manual by Robert Bentley to complement the Muir book. With these two references, available through amazon.com, you have everything you need to perform any and all repairs on your aircooled VW. Seriously, I found a copy of this book in an old 2nd hand shop. Paid $10 for it, and started to read it. I was amazed! Within 2 weeks, I was the proud owner of a 75 VW Bus! I've owned three editions of this book. I love it so much. It is just so much fun and informative at the same time. No classic VW owner should be without this book! Browse other Reference, Nonfiction titles.